Herbs, perennial, cespitose; rhizomes 0.5-2 cm, often absent. Culms trigonous, (20-)60-70(-100) cm × 2.4-6.9 mm, scabrid on angles. Leaves 4-12, flat to V-shaped, with readily visible cross ribs especially on abaxial surface, 20-50 cm × 3-14 mm. 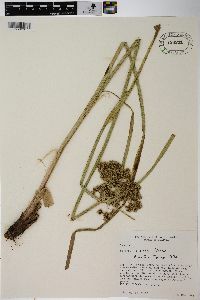 Inflorescences: heads digitate to hemispheric, 1-3.5 cm diam. ; rays 6-12, 1-9(-14) cm; 2d order rays often present, (0.5-)1-3 cm; 3d order rays occasionally present, 5-12 mm; bracts 4-8, horizontal to ascending at 30°, with prominent cross ribs,V-shaped, (1.5-)3-50(-75) cm × 0.5-13 mm; 2d order bracts 3-10 × 1-2 mm. Spikelets 10-40(-50), oblong to linear-lanceoloid, 5-18 × 2-3.2 mm; floral scales 10-40, pale grayish brown, or greenish, proximally greenish or brownish, oblanceolate, 2-keeled, weakly to distinctly 1-ribbed, proximal half 2-ribbed, (1.3-)1.5-2(-2.4) × 0.9-1.4 mm, apex acute (sometimes mucronulate), apically glabrous, occasionally scabridulous. Flowers: stamens 1-2; anthers 0.8-1.4 mm; styles 0.8-1 mm; stigmas 0.6-0.8 mm. Achenes brown, slightly to distinctly stipitate, ellipsoid (2.7-4.1 times as long as wide), (0.9-)1.2-1.5 × 0.3-0.4 mm, apical beak 0.1-0.5 mm, surfaces glabrous. Fruiting spring-fall. Wet pastures, marshes, roadside ditches; Ala., Fla., Ga., La., Miss., N.C., S.C., Tex. ; Mexico; Central America; South America.